The body of a 24-year-old Virginia woman was found 10 days after an earthquake and tsunami devastated the coastal city where she taught English, the Associated Press reported Tuesday. The death of Taylor Anderson was the first confirmed American fatality from the natural disaster, the U.S. State Department reported this week, as authorities continue to find and identify thousands of people believed to be missing. It's not clear how many Americans might be missing. Anderson spent more than two years overseas and enjoyed living in Japan, which was a longtime dream for her. She was last seen riding her bike away from an elementary school after making sure students were safe following the earthquake. 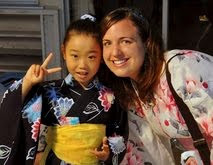 Anderson earned a spot with the Japan Exchange and Teaching Program and moved overseas after graduating from Randolph-Macon College in 2008. She taught English at eight schools in Ishinomaki, a city about 240 miles north of Tokyo, and was set to return to Virginia in August. She enjoyed traveling around the island nation and developed great affection for her students and the Japanese people, her mother said. Anderson's high school, St. Catherine's, is planning a Japan-relief service project in her honor, as she enjoyed reaching out to the Japanese. Let's all remember those that are still missing, lost their lives, and suffering due to the unfortunate events in northern Japan.